National Examination Board (NEB) has announced the official exam routine of grade 11 and grade 12 for year 2076 B.S. The routine is valid for both the regular and partial students of class 11 & class 12. 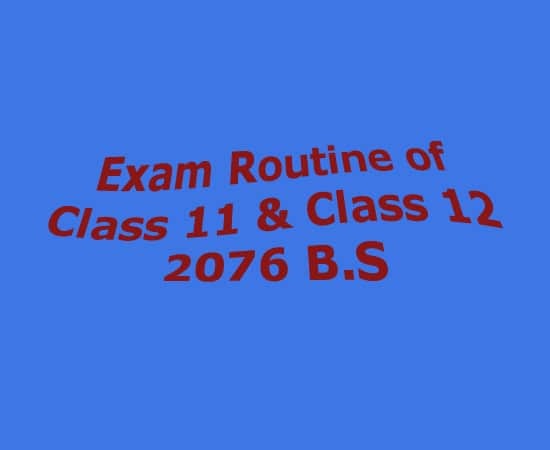 You can either view the exam routine of class 11 and class 12 online below or download the exam routine of Grade 11 and Grade 12 for year 2076 B.S in pdf format below. According, to NEB Sanothimi, Bhaktapur [prev. HSEB] the exam is due, to start from 2076/1/15 [Baisakh 15th 2076 B.S] for Grade 12 students and from Jestha 8th 2076 B.S [2076/02/08] for Grade 11 student. The time schedule is also being confirmed. For both the grade students, the 2076 B.S NEB Exam starts from 7am in the morning. Download Class 11 Exam Routine 2076 B.S.